Submitted by omniwarrior on January 16, 2009 - 1:05am. Submitted by Filoaha on January 16, 2009 - 1:15am. Submitted by WhitRae on January 16, 2009 - 7:03am. Hi, I've been lurking a long time and never commenting - so, HI! Also, I just got married - we were planning this big elaborate thing and just said screw it and went to the courthouse. Loads easier and a money saver! Submitted by aj2x on January 16, 2009 - 7:42am. Oh, such a romantic! Even my practical, show-no-emotions dad did better than that in 1946. We should hear more from your mother about their wedding! Submitted by novaengliae on January 16, 2009 - 9:11am. I just have to say, we got married with the ceremony and big party afterwards and all that, and it was fantastic, I wouldn't have changed it for anything. However, nothing we did was in the remotest "traditional" as we are not really traditional kind of people. We went cheap (hiring a retired baker for our cake and a photography teacher for our photos) and simple, and it was great. We briefly discussed eloping, but I keep looking back at our photos and I'm glad we didn't. Submitted by mystycalmage on January 16, 2009 - 12:17pm. I've been engageed for a year and a half (actually, a little more) and we've been dating for over 4 1/2 years. We still haven't set a date yet. Submitted by Maxy_Dawg on January 16, 2009 - 1:39pm. Submitted by NCHammer326 on January 16, 2009 - 4:21pm. Submitted by Wrong number on January 16, 2009 - 7:48pm. Submitted by Ducklette on January 16, 2009 - 8:48pm. Heheheh, awesome, the pun is SO BAD though :) The art is really good though. Submitted by Mr Awesome on January 17, 2009 - 1:18am. Submitted by DJKaiba on January 17, 2009 - 4:03am. Submitted by JesseT77 on January 17, 2009 - 11:28am. Submitted by illinest on January 17, 2009 - 8:42pm. good comics either way. high fives. did you read kare kano? i like. Submitted by bk-o on January 18, 2009 - 12:08am. I don't get the pun... I must be young... or stupid. Probably both. Submitted by carroca on January 18, 2009 - 12:44am. 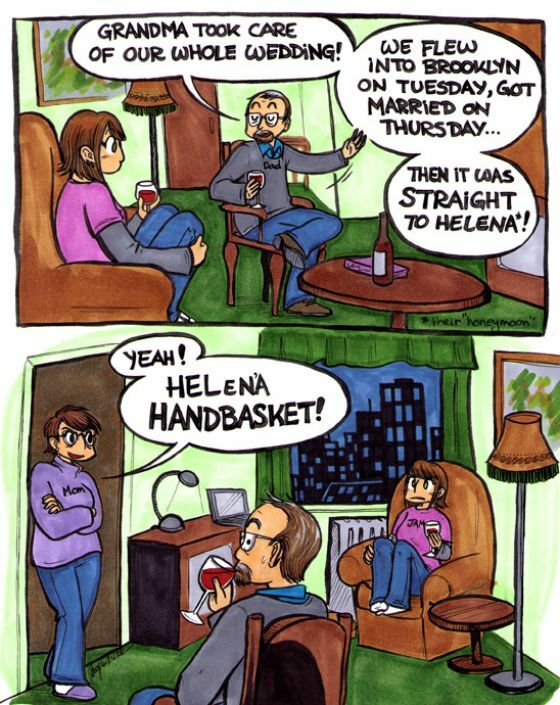 Helena handbasket = "Hell in a handbasket"
It's an old phrase meaning, well, hell in a handbasket. A question for you, Jam: Where is this Helena? I live in Helena, the capital of Montana. Same one? Submitted by Needsmoresleep on January 18, 2009 - 6:21pm. Anyone who ever has a problem with a joke like that, heres a tip, say the joke outloud. Submitted by merpom on January 18, 2009 - 6:27pm. Oh, the puns. Sounds like something my mom would say...I can empathize with your face in the second panel. Submitted by Sutokito on January 18, 2009 - 6:53pm. Aww... I don't get it... But maybe it's for the best, right? Submitted by tinfoil on January 18, 2009 - 11:08pm. That totally sounds like something I would say! Submitted by hawkbat2001 on January 19, 2009 - 6:59am. I love bad puns when they can be pulled off in real life like that. So before he is recomended, I already read the Xanth novels by Piers Anthony, as well as Terry Pratchet books. Well that is soo off subject. Anyway I have worked a few weddings as a photographer as a favor to friends. I hope your planning and wedding day is not like those, as stress is the killer to the magic day. Submitted by Foot on January 20, 2009 - 12:27am. I have caught up in the comics. Submitted by starboltchaos on January 20, 2009 - 1:41am. yar, I be caught up. I love this comic so much. Submitted by scify on January 20, 2009 - 8:52am. Suto: It's a word play on a phrase that's sadly fallen out of fashion. Submitted by Anonymous on January 20, 2009 - 12:28pm. Submitted by Anonymous on January 21, 2009 - 10:40am. Submitted by Sutokito on January 21, 2009 - 1:40pm. Yes, submit thrice. Just as planned. Submitted by Sutokito on January 21, 2009 - 1:42pm. I understood that it was " Hell in a Handbasket" but didn't know what meant. Submitted by Jam on January 21, 2009 - 6:33pm. Writing comics is an excellent way to determine what sayings are regional, apparently! Helena was my parent's honeymoon destination.